The city of Palmyra originated as a simple settlement around an oasis in the middle of the desert. The name comes from the same root as our name for Palm tree. Its wealth and fame came about as a result of the silk trade making it a vital stopping point. Being equidistant between the Roman and the Persian empires it was always likely to fall under the influence of one or the other, but under some circumstances had the chance to play one off against the other. As Rome extended its influence into the East it tended to be the most powerful actor on the stage and the Palmyrans tended to lean in its direction, even though they always maintained a nominal independence. Trading people have an instinctive ability to know which side of their bread has the butter on it. The leading citizens tended to be educated in latin and were able to treat on equal terms with Roman Senators. But the peculiar circumstances of the crisis of the third century gave the strategically positioned city of Palmyra a unique opportunity to assert itself. With the Roman military machine neutralised by barbarian invaders and with Persia reasserting its power in a very direct way, the options open to the desert city were to either fall under the sway of the Persians or to take matters into their own hands. We have already heard how Odenathus came to the fore in the chaos that followed the capture of Valerian. As the Persians invaded he had the presence to muster military resources to harry the retreat of the Persian army from Roman territory. He was able to bring the whole of the eastern half of the empire under his sway, with official approval from Rome, and to establish an effective state able to hold back the Persians. In fact, he was able to raid as far as the capital of Persia itself. Gallianus was happy enough to leave Oedenathus as a buffer against the Persians and play along with the convenient fiction that he we simply a Roman official administering the Eastern provinces on behalf of the emperor. But when Oedenathus was killed in an argument over a hunting expedition, his widow Zenobia took over from him with no reference back to Rome at all. I doubt many people had been fooled to begin with, but this made what was going on obvious. The plain talking Claudius made no bones about it. 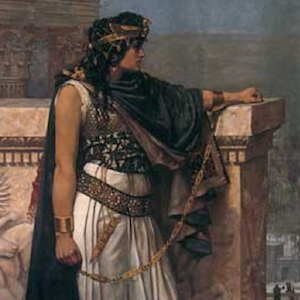 Zenobia, the Queen of the East as she styled herself was defying Rome and would need to be dealt with. But his situation, facing huge barbarian inroads, made any action impossible. So Zenobia was left to rule. She was of joint Arab and Greek descent and claimed kinship with Cleopatra with whom she is often compared. “She was of a dark complexion. Her teeth were of a pearly whiteness, and her large black eyes sparkled with uncommon fire, tempered by the most attractive sweetness.” And she was certainly an able and educated woman, speaking many languages and taking a highly active role in government. The Cleopatra connection may well have simply been propaganda because one of the first things she did was invade and conquer Egypt. Egypt’s resources, particularly of grain, made the Palmyran empire a force to be reckoned with. It also deprived the Romans of the same resources, on which they were extremely dependent. This made conflict inevitable. The reconquest of the East was very much the kind of project at which Aurelian would be expected to excel. He was an excellent general leading veteran troops. But even so, the going was tough. The Palmyrans were adept with archers and missile projectiles. Claudius had publicly rued the lack of these troops when he went into battle against the Goths a couple of years earlier. Now the Romans had to not only do without them, they had to actually fight them. As they advanced, there were two large pitched battles where Zenobia personally commanded. The Romans managed to overcome thanks to their superior hand to hand combat abilities. The lightly armed archers were no match for the legions once they had got to close quarters. But although they triumphed in the battles, the Romans had to contend with harassment from Arab tribesman (motivated by theft rather than military considerations) as they advanced on Palmyra itself. And once they lay siege to the city, the advantages once again lay with the defenders as Aurelian himself put it. He spoke from experience. He had a hands on approach and was often in the front line, where he was wounded with a dart. A siege in the ancient world was a perilous business for the besiegers. Aurelian had the problem of supplying his men far from the nearest Roman base and was in danger of attack from the Persians. And Zenobia was well aware of the difficulties he was labouring under. When he offered advantageous terms early on, they were arrogantly rejected. Her calculation was, no doubt, that the Persians would take advantage of the chance of bagging their second Roman emperor. But the situation in Persia had changed. Sapor had died and the Persian empire shared with the Roman one the lack of an effective way of selecting a successor. Far from the Palmyrians being rescued, the Romans were reinforced by fresh troops under Probus who had just successfully reconquered Egypt. As the siege progressed the Romans settled in to what they had throughout their history always excelled at. They organised an effective supply chain to get materials to the army outside the city. The extra troops enabled them to defend against a counter attack and bribery relieved the pressure from the bandits of the desert. With the tide turning against her so clearly, Zenobia decided to escape, which she did on a dromedary. I don’t know how she slipped through the Roman lines but she managed to put 60 miles between herself and the Roman camp before she was intercepted by some light horse sent to bring her back to Aurelian. Without her leadership the city soon surrendered. Aurelian left 600 archers to occupy it and returned to Emesa with piles of treasure and of course Zenobia herself. A bit of flattery always goes down well. The soldiers were calling for her head but Aurelian had other plans for Zenobia. Her entourage however, was a different story. They were executed, including the learned philosopher Longinus. The brilliance of the Palmyrian empire was no doubt largely a reflection of the brilliance of first Odenathus, and then of Zenobia herself. But they had obviously created an effective team around themselves. By wiping out her support staff, Aurelian was ensuring that there was no easy way back for Zenobia. This meant he could keep her as an ornament to his own reign. This was a very slight miscalculation. He must have thought that without the leadership of Zenobia the city of Palmyra was safe. But he had no sooner crossed the sea back into Europe than he received the news that the Palmyrians had broken out in open revolt again and had massacred the soldiers he had left behind. Aurelian instantly retraced his steps back to the city and quickly occupied it. This time, he dispensed with the easy terms and ordered widespread killing of the inhabitants. The city was ruined and was never to rise again. Palmyra had had a long history even before the rise of Rome. Up until now it had coped with the rise and fall of many empires. It is even mentioned in the Bible. The brief flowering of the Palmyrian empire could have developed into a longer lasting and interesting culture fusing Greek, Egyptian, Arab and Syrian elements. Who knows what could have come of it. If the dart that hit Aurelian had been closer to its mark, maybe Palmyra would even now be a household name. But as it is the traders of Palmyra traded a brief transient period of glory for oblivion.